Former Transvaal and South African lightweight champion Richard “Kid” Borias passed away at his home in Eldorado Park, Johannesburg on Thursday after a long illness. He was 78. Borias was born in Vrededorp, Johannesburg on July 9, 1940 and fought from 1963 to 1973 winning the Transvaal and South Africa lightweight titles in an era when fighters would have eight to nine and even more fights in a year. He made his pro debut at the Bantu Men’s Social Centre in Johannesburg on October 18, 1963 with a four round point’s victory over Gibson Twyman. Even though his record shows he lost a number of fights he fought some world class opponents like Paul Armstead, Don Johnson, Lionel Rose (former world bantamweight champion) and Joey Archer. On March 4, 1966 he stopped the 59 fight veteran Sexton Mabena in the third round to win the Transvaal lightweight title and four months later outpointed Enoch “Schoolboy” Nhlapo over ten rounds. In a return match on February 4, 1967 he outscored Nhlapo over 12 rounds to win the South African lightweight title at the Orlando Stadium in Soweto. He would have another five fights with Nhlapo winning two and losing three, all on points. Nhlapo a legend of the South African ring won the South African lightweight, junior-welterweight and welter weight titles, and is the only South African fighter to have scored 100 wins in his career. 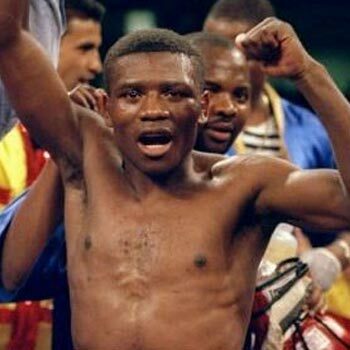 Borias also went in against some of the legendary South African fighters like Shole Mokoena, Levi Madi, Anthony Morodi Norman Sekgapane and Mackeed Mofokeng, not always winning but extending these great fighters. He lost only two fights inside the distance, to Eric Mahlo, and Lionel Rose in Melbourne, Australia. In 1973 he had his last fight and finished with a record of 36-20-10; 12 which does not reflect the true ability of this classy fighter. I never saw him fight but met him around ringside on numerous occasions in later years and will always remember Richard as a true gentleman.